Old man winter has returned in a big way over the past week, complete with severe cold, bitter wind chills, and significant snow across much of the Northeastern US. Our brief January thaw has transitioned into a highly amplified, meridional pattern, as the EPO continues strongly negative. This north Pacific / Alaskan block has been a mainstay of winter 2013-14, and if one examines the SSTA profile in the Pacific, ocean temperature anomalies persist well above normal south of Alaska. Thus, the signaling remains for a positive feedback cycle of building the mid level ridge over Alaska, and maintaining the cross polar flow from Siberia/Arctic into Canada. There are indications that some of the global indices will undergo a significant change mid/late next week, and this should play a large role in the end of January storm thread which will be discussed here. Prior to that potential, we have a light snow accumulation event coming Saturday, the 25th, with potentially (as it stands now) another light accumulation early next week. The threat for a more moisture laden, Miller A storm exists beyond the middle of next week, particularly in the January 27th-February 2nd. Let’s put together the meteorological pieces for why this potential does in fact exist. Tropical forcing has recently awakened as the latest MJO wave is progged by most model guidance to progress through phase 7. MJO phase 7 in January generally argues for the development / persistence of -EPO blocking, PNA ridging, and Arctic/NAO blocking as well. MJO phases 7, 8, and 1 are the most conducive for sub tropical jet activation and so I wouldn’t be surprised to see models beginning to detect a stronger southern stream short wave for later next week. So far this winter, the dominant snow producer has been northern stream Miller B type short waves. These are systems which can provide significant to major snows given the surrounding synoptics are favorable for tilting and deepening near the east coast. Miller A type storms, however, originating in the sub tropical jet stream, often are moisture laden and bigger snow makers. 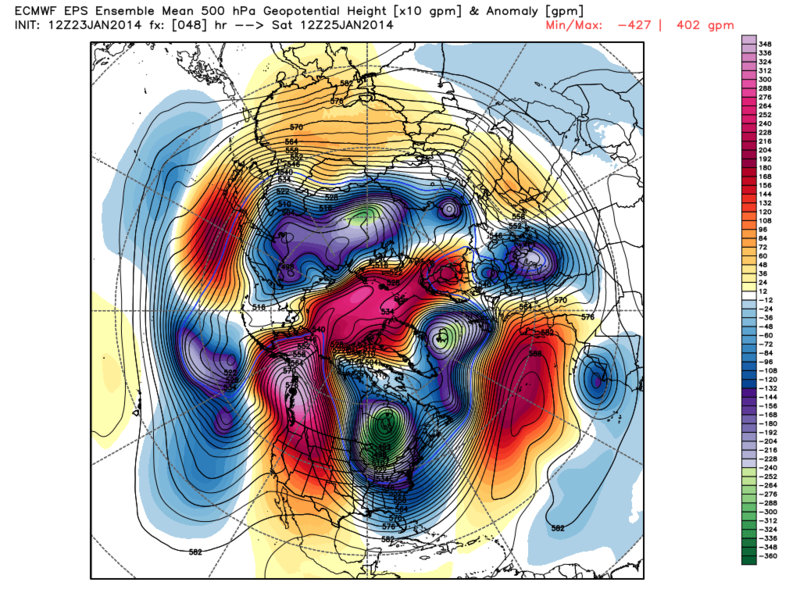 Below is the MJO phase 7 500mb composite. 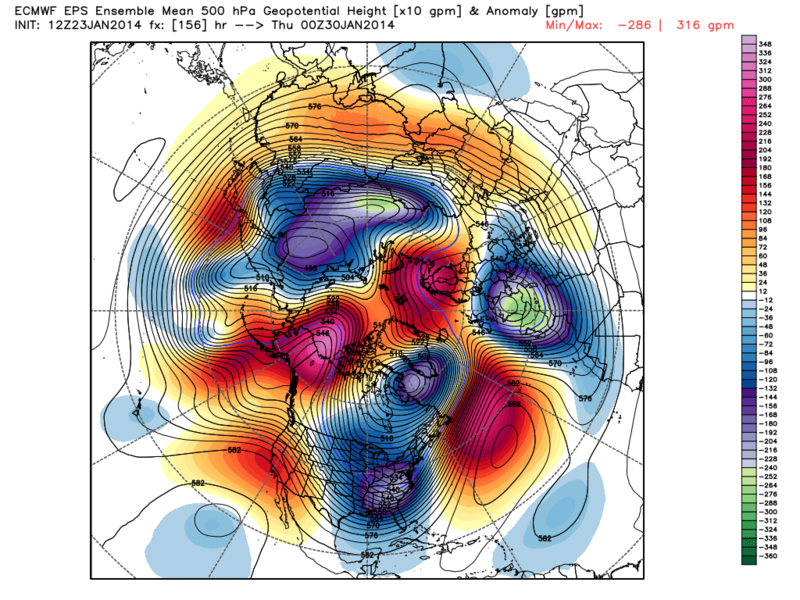 Notice the ridging in the West, across the arctic, and in the NAO regions. Later next week, we have an initial pattern of higher than normal heights around Greenland with a fairly strong negative NAO. That particular signal should be oscillating toward neutral or even positive by the beginning of February. When we see a rapid increase in NAO values, usually on the order of at least 2 standard deviations, it indicates height rises along the SE US coast. That is a cyclogenesis / stormiess signal often noted by Heather Archambault, who researched the impact of NAO modality change and its relationship with east coast storms. 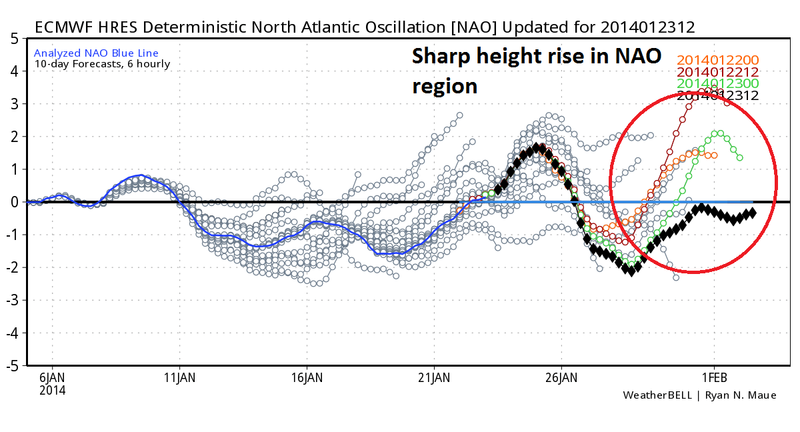 The ECMWF suggests the NAO could rise from around -2 SD to potentially +1 SD or higher. Regardless of the exact values, confidence is fairly high that the NAO will be rising later next week as the block shifts northward, and heights increase in the SE US. Another potential indicator of east coast storminess is the rapid and sharp decline of the PNA. 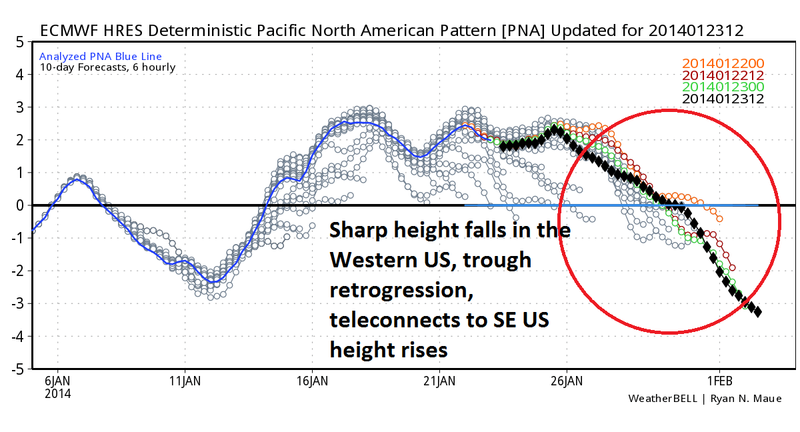 Since this index involves Western US height anomalies in particular, it follows that a PNA modality change from positive to negative should yield heights lowering in the West. In other words, the mean trough currently near the east coast is liable to retrograde westward into the Plains, thereby causing the Western ridge to also move west. Basically, these shifts would promote increased baroclinicity near the east coast due to our area being on the eastern periphery of the trough rather than centrally located within the trough axis. More PVA (positive vorticity advection) and upward motion / storminess tends to occur along the eastern edges of troughs, where low level convergence and upper divergence is greatest. The ECMWF ensembles are seeing the retrogression of the trough for next week, the movement northwest of the Polar Vortex, which could allow for a sub tropical jet short wave to progress northeastward in the East. Beyond the pre-Super bowl time frame, a pattern in which a north to south thermal gradient could develop nationwide. The EPO and AO will remain generally negative, so Canada will continue to be a good source region of Arctic air/sfc high pressure. However, with the PNA going negative and the mean trough retrogression, the introduction of more SE ridging should occur. Therefore a tight battle ground zone could initiate from the Plains to the Northeast with waves running along that baroclinic zone. This is for the period beyond February 2nd and into the early/mid part of February. Right now it appears there won’t be any prolonged warm spells through early February, and a pattern of cold across the northern tier, warmer in the Southeast, with wintry chances in the middle, could occur. Historically, patterns of negative EPO, negative PNA, and negative AO have proven to be cold ones generally from coast to coast. Before February hits though, a storm threat exists for the end of January due to the reasons outlined. The transitioning states of the NAO and PNA are indicators that height rises may occur in the SE US thereby signaling a northeastward moving STJ wave, especially given the background tropical forcing signal as well. It’s too early to say details regarding the potential storm threat, but with a Miller A already depicted on some guidance, it has a chance to be a large snow producer. Of course, it may not happen, but one needs to realize the potential it very much heightened for a significant event in the January 27th-February 2nd period.